Sometimes, when you are fishing, the hook becomes stuck on a patch of weed or ends up embedded in a submerged branch or root. Sometimes the leger rolls beneath a stone or boulder on the riverbed. The tackle is snagged! The rod arches dangerously. The line begins to sing and stretches as taut as a violin string. And then....snap! And all is lost! Sometimes you think you are snagged but suddenly the riverbed seems to move. The fishing rod bends and kicks. You have hooked a fish....a muscular, powerful fish that is determined to fight for freedom. You have hooked a barbel. The barbel is brown, and occasionally greenish-brown, across its back. The fins are large to give the fish ease of manoeuvrability in fast water. The most distinguishing feature of the barbel is the presence of barbules. There is a barbule at each corner of the mouth and two more protruding just beneath its snout. These barbules have taste and touch cells and help the fish to locate food on the riverbed. It is rare to catch a small barbel. The usual weight is between 1kg. and 3.5 kg. Barbel that weigh more than 4.5 kg. are considered by anglers to be a specimen fish. Although most rivers will hold barbel, the fish tend to be more prolific in well oxygenated waters. A top spot for locating barbel would be weir pools, fast glides and at the end of rapids. Try places where there is bubble filled clear water and stretches where there is an abundance of streamer weed. Streamer weed looks like long, green tattered rags. Barbel feed on the bottom using their barbules to find food. In shoals, they will graze the gravel beds sucking up into their leathery mouths the tiny creatures that dwell among the small stones. For its weight, the barbel is the strongest freshwater fish. They fight with determination and endurance and therefore sturdy tackle is needed to match the barbel's power. Specialist rods are available for specimen hunters and dedicated barbel anglers but for the novice a general purpose float rod will do the job. Use a fixed spool reel fitted with line of about 6lbs. breaking strain. As a basic rule, the size of the hook depends on the size of the fish and the size of the bait. For barbel use hooks that range between a 6 and a 10. Choose barbless hooks because they cause less damage to the fish and are easier to unhook. For the beginner, choosing equipment can be very confusing but don't worry. It's always a good idea to chat to the people who work in the tackle shop. They are usually fishermen and will be glad to offer advice and guidance. After all, you are potentially a regular future customer! The most popular way of catching barbel is by float fishing or by using leger. Remember, barbel tend to inhabit fast flowing water so it makes sense to choose a float that is highly visible. Try a "loafer" or a "crystal Avon". 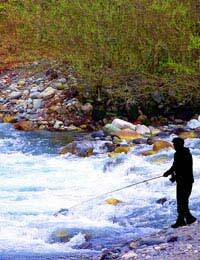 When legering in fast water it is important to use a weight that will hold bait close to the riverbed. A bomb type leger would be ideal. This kind of weight, such as an "Arlesey" bomb, is also curved so that it will roll with the current and therefore cover more fishing areas. A variety of bait can be used to catch barbel. Many anglers use worm, maggots, casters or sweetcorn. "Smelly" bait such as luncheon meat, sausage meat and cubes of cheese have all proved to be successful in taking good fish. Catching the first barbel is an unforgettable experience. Initially, the line appears to be snagged. You pull and pull desperately trying to free the tackle but then....unexpectedly....something starts to pull back! You are connected to a creature with attitude! A barbel is hooked....your heart rate increases....you've got a fight on your hands....and it's a fight that may not be as one sided as you first thought!